A picture wall is a wall frame display similar to your own mini art gallery. Basically, it is a ton of different sized pictures thrown on a wall with some kind of order to it. A picture wall is a popular way to display family portraits, artwork, or any type of memory you want to share with the world. A popular place many people are designing their picture wall is around their staircases. A picture wall display easily livens up a usually boring staircase and is the perfect area to place smaller family photos. As you walk up or down the steps you can arrange the wall frames to gradually age for a nice effect. One way to spice up your picture wall is to use shelves to help display your pictures. The majority of picture walls are simply a collection of wall frames hung together that all have a matching theme. Using shelves is an underrated means to add a different feel to your picture wall. Also, using a ledge display can save space because you can layer your pictures in order to fit more in a smaller space, something that’s not as easy when arranging them on a picture wall. On a similar accord, monograms are a nice decorative design that can add flair to you picture walls. This is especially prevalent if you are hanging family photos as it can be a nice way to identify the people photographed as well as break up the monotony of the wall frames. 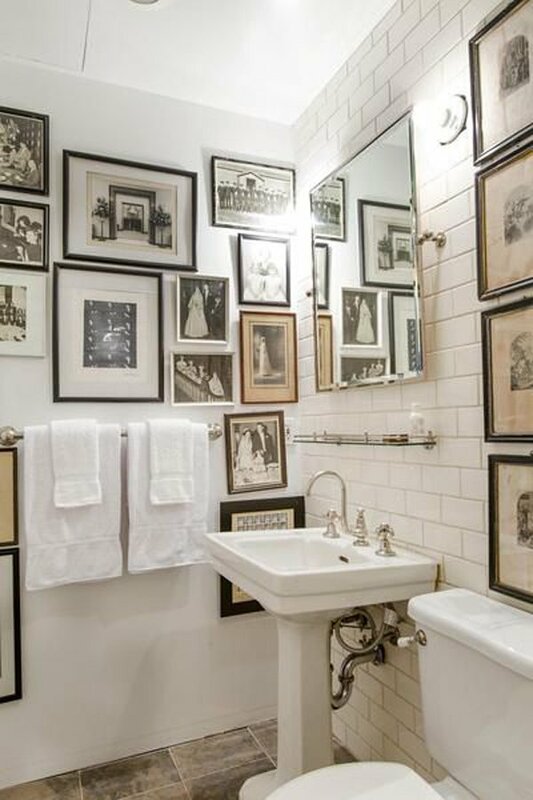 The newest trend in picture walls is taking full advantage of your bathroom. Similar to how picture walls can be used to liven up a staircase, they can also bring to life a bland bathroom. A mistake that some people don’t even consider when embarking on their own picture wall journey is sticking with only the standard photo size. The pictures you chose to hang on your picture wall do not have to be uniform. In fact, using different photo sizes as opposed is a great way to make your picture wall less repetitive. Lastly, make sure you know the proper methods of how to hang pictures so as not to damage the wall or the frame. Then head on over to Frame USA and select some frames so you can get your picture wall started today! Take a look at our DIY Page for more do-it-yourself picture frame ideas.